Completely restored with Edelman leather, which is the highest quality (and most expensive) leather you can buy, this incredible set of Paul Evans for directional dining chairs includes four (4) side chairs and two (2) captain's chairs and definitely qualify for the term "Fine examples" of this design. Note we have additional leather and chairs if you require a larger set, contact us for details. The labels underneath read "Directional, custom collection", these custom collection chairs were already special when they were first designed by and produced in the 1970s, but now they are even more special with the combined exquisiteness of Edelman Leather and expert craftsmanship in its tailored upholstery. If you don't believe us, see the close up pics in the photo gallery or come in to our showroom to view them in person. The leather is so high quality, Edelman Leather, owned by Knoll group and produced in Italy, is well regarded as being the best of the best and this custom leather is called "Napoli" which is thicker and heavier than most hides, ages the way leather should - where every year it just gets more and more exquisite and beautiful as it gains character through use. The contrasting white thread in the upholstery work gives the look and feel of custom tailored suits. We have additional leather and chairs for more chairs if you require, message us with how many you need and we can custom tailor to suit. These sophisticated dining chairs are also incredibly comfortable. New high quality foam was used, which is a huge improvement that is often missed. After 40 years of use, old foam can become hard and uncomfortable. New high quality foam gives the improvement of better ergonomics, comfort and hygiene. These days, anything by Paul Evans is exceedingly sought after and collected. Demand in his work with directional and his custom studio, have soared over the years and the supply has become increasingly scarce. Some of Paul Evans works have demanded prices over $200,000 and there are no signs of slow down as collectors are now not the only ones searching for Fine examples of his work, designers and architects are now aware and decorating their high-end projects with it. Routinely you will find images in luxury design and interiors magazines of rooms decorated with Paul Evans pieces. Whether you are working with a designer or buying for yourself - this set of chairs will make your room cover-worthy. This set of four side chairs and 2 armchairs by Paul Evans for directional, would be a perfect fit with a Modern, Post-Modern or Mid-Century Modern dining table or conference table. Also consider for contemporary, traditional, transitional, classical and Spanish styled homes for a twist of the unexpected. Chairs can also be used in a corporate environment such as a retail boutique, luxury hotel, upscale restaurant or lobby lounge, member's club, executive office, design studio, creative agency, or fine art gallery. Condition: Excellent restored condition with new Edelman Leather in "Napoli", with contrasting white thread work. Frames are clean and bright. Chairs are ready for immediate use and are magazine-cover-worthy. Labels underneath read "Directional, custom collection" Measurements: Side chairs H 34.5" / D 24" / W 18.5" Seat height 20.5" Arm chairs H 34.5" / D 24" / W 22.5" Seat height 20.5". 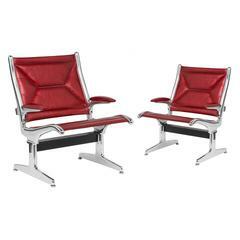 Four caned back chairs designed by Paul McCobb for Directional with new red wool high-quality upholstery.